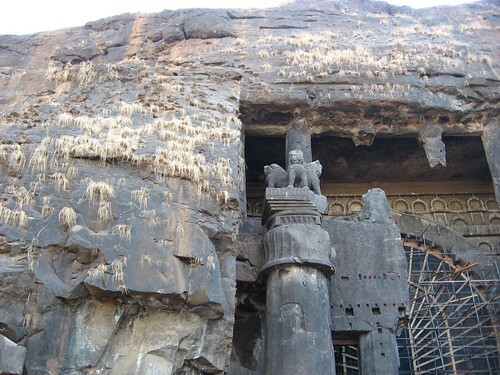 The Karla and Bhaja Cave complex, near Lonavala on Mumbai-Pune expressway are one of the finest examples of the ancient rock-cut caves found in India and predate the World famous Ajanta and Ellora caves. These caves have been built, rather excavated, by hewing out the rocks from the difficult terrain of a rocky hillside. 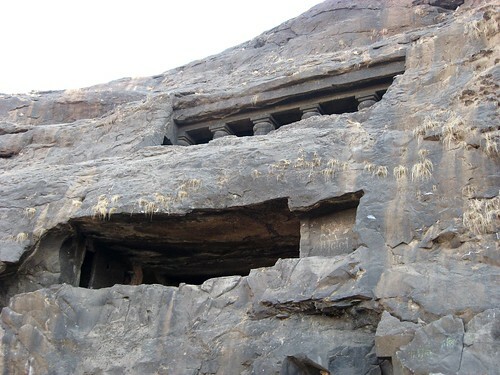 During this period it is likely that thousands of caves like Karla were excavated in surrounding Sahyadri Hills. 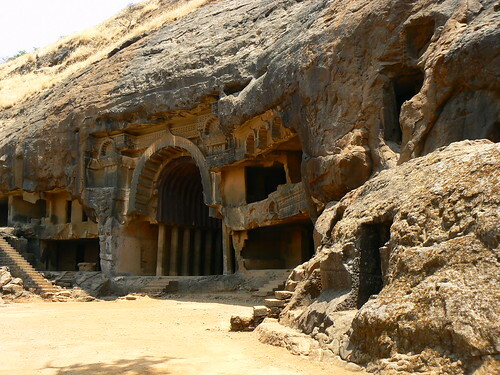 These caves are on an major ancient trade route, running eastward from the Arabian Sea into the Deccan. As per historians Buddhism, having become identified with commerce and manufacturing through their early association with traders, tended to locate their monastic establishments in natural areas close to major trade routes so as to provide lodging houses for travelling traders. 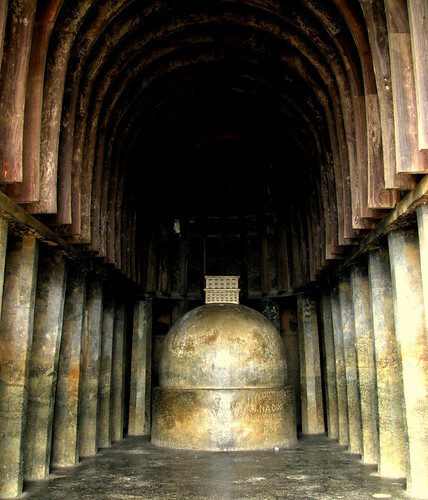 Karla Caves complex was built over the period of 3rd to 2nd century B.C. and the oldest one is believed to date back to 160 BC. The complex is believed to be the oldest surviving Buddhist school (Theravada - Meaning "the Teaching of the Elders" or "the Ancient Teaching"). The main cave has a magnificent carved prayer hall with huge pillars and intricately carved relief's and that houses a stupa. On ef the strange feature is that these caves do not actually show the image of Buddha. The outside facade has intricate details carved to imitate finished wood. 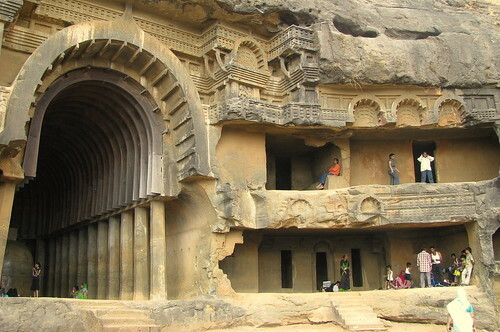 Bhaja Caves complex is a group of 18 rock-cut caves dating back to 200 BC and is about 6 km south of Karla Caves. 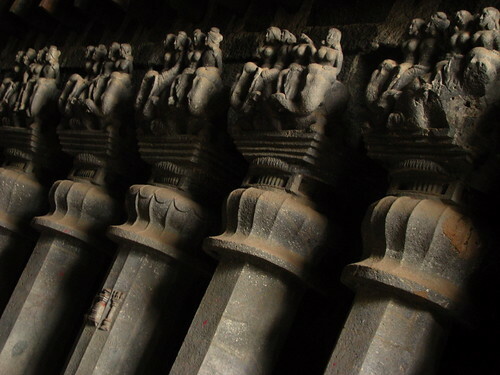 These caves share the same set of architectural designs and style as the Karla Caves.